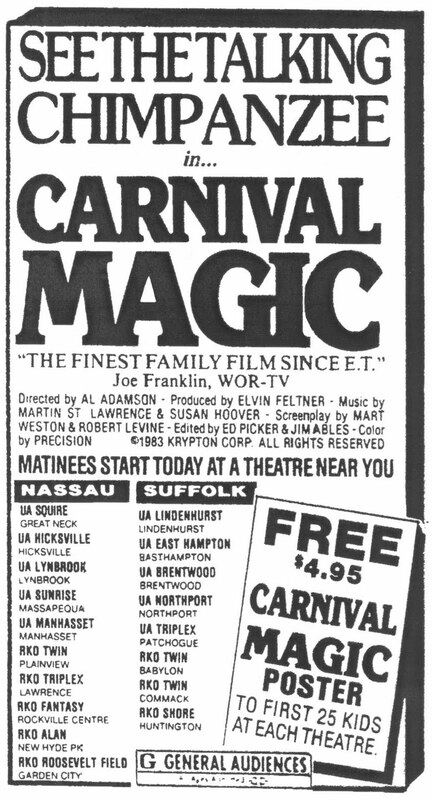 TEMPLE OF SCHLOCK: CARNIVAL MAGIC on TCM Underground in October! The late Al Adamson’s G-rated talking monkey movie CARNIVAL MAGIC has been the source of rumors and wild speculation for nearly 30 years. Some folks insist that only one print was ever struck (which would mean the same print that was screened for Variety was also used for the German-language VHS? ), while others claim that the film never saw the light of day anywhere until a copy was "found" in Adamson's house shortly after his murder in 1995. Hogwash! We're happy to report that the negative, the screenplay, 16 complete 35mm prints, outtakes, pressbooks, one-sheets and other materials for the elusive CARNIVAL MAGIC were discovered last November in a warehouse somewhere on the east coast, and TCM Underground will be premiering the newly restored master on October 29th at 2:45 a.m. Our inside source also informs us that a 2-disc special edition DVD will be out sometime before 2011. We were fortunate enough to catch CARNIVAL MAGIC last year during the Alamo Drafthouse's Cinemapocalypse tour, but we can't wait to see it again and we're very excited that Adamson's penultimate feature will be making its long-awaited home video debut in such an impressive package. Meanwhile, feast your eyes on the rare newspaper ad below, which appeared in New York Newsday on November 25th, 1983. I am SO looking forward to this. Never seen it. And it has that dude who used to be on "Guiding Light." Anyone know if Sam Sherman has taken a look at any of this stuff? I know he wasn't involved in this one, but it's one of the last Adamson titles to hit DVD. Now somebody get cracking on JESSI'S GIRLS, and dig up a copy of LASH OF LUST. 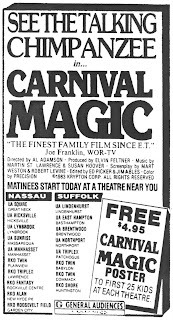 Is there any way to get a copy of Carnival Magic?